Robert William Flay (born December 10, 1964) is an American celebrity chef, restaurateur, and reality television personality. He is the owner and executive chef of several restaurants: Mesa Grill in Las Vegas and Nassau; Bar Americain in New York and at Mohegan Sun; Bobby Flay Steak in Atlantic City; Gato in New York, and Bobby's Burger Palace in 19 locations across 11 states. Flay has hosted several Food Network television programs, appeared as a guest and hosted a number of specials on the network. Flay is also featured on the Great Chefs television series. Flay was born in New York to Bill and Dorothy Flay. He was raised on the Upper East Side neighborhood of Manhattan. He is a fourth generation Irish American and was raised Catholic, attending denominational schools. At age 8, Flay asked for an Easy-Bake Oven for Christmas, despite his father's objections; his father thought that a G.I. Joe would be more gender-appropriate. He received both toys. Flay dropped out of high school at age 17. He has said his first jobs in the restaurant industry were at a pizza parlor and Baskin-Robbins. He then took a position making salads at Joe Allen Restaurant in Manhattan's Theater District, where his father was a partner. The proprietor, Joe Allen, was impressed by Flay's natural ability and agreed to pay his partner's son's tuition at the French Culinary Institute. Flay received a degree in culinary arts and was a member of the first graduating class of the French Culinary Institute in 1984. After culinary school, he started working as a sous-chef, quickly learning the culinary arts. At the Brighton Grill on Third Avenue, Flay was handed the executive chef's position after a week when the executive chef was fired. Flay quit when he realized he was not ready to run a kitchen. He took a position as a chef working for restaurateur Jonathan Waxman at Bud and Jams. Waxman introduced Flay to southwestern and Cajun cuisine, which came to define his culinary career. After working for a short time on the floor at the American Stock Exchange, Flay returned to the kitchen as the executive chef at Miracle Grill in the East Village, where he worked from 1988 to 1990. He caught the attention of restaurateur Jerome Kretchmer, who was looking for a southwestern-style chef. Impressed by Flay's food, Kretchmer offered him the position of executive chef at Mesa Grill, which opened on January 15, 1991. Shortly after, he became a partner. In November 1993, Flay partnered with Laurence Kretchmer to open Bolo Bar & Restaurant in the Flatiron District, just a few blocks away from Mesa Grill. 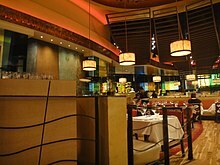 Flay opened a second Mesa Grill at Caesars Palace in Las Vegas in 2004, and in 2005 he opened Bar Americain, an American Brasserie, in Midtown Manhattan. He continued to expand his restaurants by opening Bobby Flay Steak in the Borgata Hotel Casino & Spa in Atlantic City, New Jersey. This was followed by a third Mesa Grill in the Bahamas, located in The Cove at Atlantis Paradise Island, which opened on March 28, 2007. The Las Vegas Mesa Grill earned Flay his only Michelin Star in 2008, which was taken away in the 2009 edition. Michelin did not publish a 2010 or 2011 Las Vegas edition, so the star could not be re-earned. Bolo Bar & Restaurant closed its doors on December 31, 2007, to make way for a condominium. Aside from his restaurants and television shows, Flay has been a master instructor and visiting chef at the French Culinary Institute. Although he is not currently teaching classes, he occasionally visits when his schedule permits. 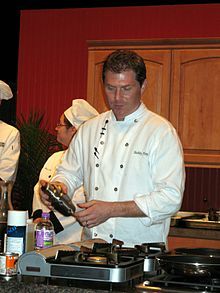 Flay established the Bobby Flay Scholarship in 2003. This full scholarship to the French Culinary Institute is awarded annually to a student in the Long Island City Culinary Arts Program. Flay personally helps select the awardee each year. Flay opened Bobby's Burger Palace (BBP) in Lake Grove, Long Island on July 15, 2008. The restaurant is located at the Smith Haven Mall. A second location opened on December 5, 2008 at the Monmouth Mall in Eatontown, New Jersey, and a third location opened March 31, 2009 in The Outlets at Bergen Town Center in Paramus, New Jersey. His fourth shop opened at the Mohegan Sun Casino in southeast Connecticut on July 1, 2009, which is also the location of his second Bar Americain, which opened on November 18, 2009. His fifth location of the burger chain opened in Philadelphia's University City on April 6, 2010. The sixth location of Bobby's Burger Palace opened in Washington, D.C., at 2121 K Street in Northwest on August 16, 2011. On December 5, 2011, Flay opened the ninth location of Bobby's Burger Palace in Roosevelt Field Mall in Garden City, New York. Flay opened the tenth and largest Bobby's Burger Palace site at Maryland Live! Casino in Hanover, Maryland, on June 7, 2012. Bobby's Burger Palace also has an 11th location, in College Park, Maryland. In total, BBP has nineteen locations in eleven states and the District of Columbia. 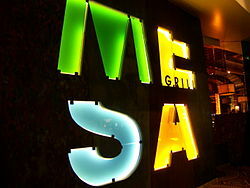 The original Mesa Grill in New York closed in September 2013 following a proposed rent increase by the landlord. Flay served as a judge on Wickedly Perfect, The Next Food Network Star, and The Next Iron Chef. He has cooked on Emeril Live and Paula's Party. On Throwdown! with Bobby Flay, the chef challenges cooks renowned for a specific dish or type of cooking to a cook-off of their signature dish. On Episode 5 of Season 4, Harlem chef Melba Wilson and Bobby squared off over who had the best chicken and eggnog waffles. While being interviewed on "Conversations with Allan Wolper" on WGBO 88.3FM, Wilson confessed that she had been nervous because Bobby brought a cast iron skillet. Having grown up in a family that used cast iron skillets, Wilson was nonetheless forced to use a deep fryer because her restaurant was too small for a cast iron skillet. Towards the end of the anecdote, she explained, "Can I tell you? When he pulled out the skillet, it was a rough day. Girlfriend started sweating bullets. But at the end of the day, we threw down – I don't know, I think it was the eggnog – and I won." Flay is an Iron Chef on the show Iron Chef America. In 2000, when the original Iron Chef show traveled to New York for a special battle, he challenged Iron Chef Masaharu Morimoto to battle rock crab. After the hour battle ended, Flay stood on top of his cutting board and raised his arms in what one journalist wrote was "in premature victory". As Morimoto felt that real chefs consider cutting boards and knives as sacred, and being offended by Flay's flamboyant gesture, he criticized his professionalism, saying that Flay was "not a chef". Flay went on to lose the battle. Flay challenged Morimoto to a rematch in Morimoto's native Japan. This time, Flay won. Flay and Morimoto, both Iron Chefs on Iron Chef America teamed – took on and won – against fellow Iron Chefs Mario Batali and Hiroyuki Sakai in the Iron Chef America: Battle of the Masters "Tag Team" battle. On a special episode of Iron Chef America originally airing on November 12, 2006, Flay and Giada De Laurentiis faced off against, and were defeated by, Batali and Rachael Ray. This was the highest rated show ever broadcast on Food Network. Flay and Michael Symon defeated the team of Iron Chefs Cat Cora and Masaharu Morimoto in a special episode titled "Thanksgiving Showdown," which originally aired on November 16, 2008. On November 29, 2009, Iron Chefs Morimoto and Flay faced off one-on-one again in Battle Egg Nog. The battle, which featured ice-carvers, was won by Morimoto by a single point. In an episode recorded in July 2010 and broadcast in March 2011, Montreal cooking show host Chuck Hughes beat Flay to become the youngest Canadian champ. In an interview afterward, Hughes recalled, "When I met him I said, 'Hi Bobby,' and my voice cracked a bit and I gave him an official [Montreal] Canadiens jersey, to which he replied, 'Thank you so much — but it's not going to help.'" The half-hour series pits select chefs against host Flay to see if they can create dishes that are better than his. As Flay's most successful series on Food Network the prior season, episode 5 of season 17, featuring Debbie Gibson and Katie Lee, was chosen as the 2018 lead-out show for season 14 of Food Network Star. Bobby's Vegas Gamble — Covers the opening of Mesa Grill Las Vegas. Restaurant Revamp — Flay tries to help a family restaurant. Chefography: Bobby Flay — Biography of Flay's life and career. Tasting Ireland — Flay takes a food tour of Ireland, his ancestral homeland. Food Network Awards — The Food Network recognizes people and places that have impacted the food world. All-Star Grill Fest: South Beach — Flay joins Paula Deen, Giada De Laurentiis, Alton Brown, and Tyler Florence for a barbecue. In 1996, Flay hosted The Main Ingredient with Bobby Flay on Lifetime Television. Twice a month, he hosts a cooking segment on CBS' The Early Show. He hosted the reality television show America's Next Great Restaurant on NBC from March 2011 to May 2011 in which in the end he picks one restaurant team with whom to open a restaurant. The reality show was canceled after the first season due to low ratings. Flay had a cameo appearance in the Disney Channel original movie Eddie's Million Dollar Cook-Off as the host of the cook-off. He appeared on the television game show Pyramid with fellow Iron Chef Mario Batali as the guest celebrities in an episode originally airing on November 18, 2003. He appeared as a judge on the CBS television show "Wickedly Perfect" during the 2004–05 season. He also appeared in the Law & Order: Special Victims Unit episode "Design", which originally aired on September 22, 2005. He had a small role as himself in the 2006 film East Broadway, in which his wife, Stephanie March, had a larger role. Jeopardy! featured a special "Throwdown with Bobby Flay" category during the March 12, 2008, episode, in which each of the clues featured Flay. He participated in the 2008 Taco Bell All-Star Legends and Celebrity Softball Game played at Yankee Stadium after the 2008 MLB All Star Game; Flay played for the National League. Flay is also mentioned in the movie Step Brothers in the "derek comes for dinner" scene. In 2010, Flay was impersonated in the South Park cartoon episode Crème Fraiche. In 2011, Flay had recurring appearances in the final season of Entourage as the boyfriend of Ari Gold's wife. In 2012, Flay appeared on Portlandia, in a director's cut of the episode Brunch Village. He showed director Jonathan Krisel how to make the perfect marionberry pancakes. Flay guest stars as himself on season two of the TV series Younger, which initially aired in 2016. In 2018, he appeared as Fred Jones' uncle in the animated film Scooby-Doo! and the Gourmet Ghost. Flay hosted a weekly call-in show on Sirius XM Satellite Radio. He offered advice to men on "everything from sports to current issues", although food was the focus. Flay has a personal interest in Thoroughbred horse racing. He is the owner of more than one graded stakes race winner, including More Than Real, who won the prestigious 2010 Breeders' Cup Juvenile Fillies Turf and part owner of Creator, who won the third jewel of the triple crown the Belmont stakes. He serves on the Breeders' Cup board of directors. He was a candidate for chairman in 2014, but was not elected. Flay married Debra Ponzek, also a chef, on May 11, 1991. Flay and Ponzek divorced in 1993, and Flay married his second wife, Kate Connelly, in 1995. They have a daughter named Sophie. Flay and Connelly separated in 1998, and later divorced. Flay married actress Stephanie March, on February 20, 2005. According to media reports, March and Flay separated in March 2015 and their divorce was finalized on July 17, 2015. Flay has been dating Heléne Yorke since February 2016. ^ Halic, Dana (January 4, 2017). "Bobby Flay's Burlington Burger Restaurant Closes". boston.eater.com. Retrieved May 19, 2017. ^ a b c d "Bobby Flay Biography: Chef (1964–)". Biography.com (FYI/A&E Networks). Retrieved April 9, 2015. ^ a b c d "Bobby Flay profile". Chefography. Episode CHSP08. April 11, 2008. Food Network. ^ "Locations – Official website of Bobby's Burger Palace". bobbysburgerpalace.com. Retrieved June 2, 2015. ^ a b c "Great Chef Bobby Flay". GreatChefs.com. Retrieved April 9, 2015. ^ Miller, Samantha; Lisa Kay Greissinger (July 13, 1998). "Hot Hands". People. Time, Inc. Retrieved March 14, 2009. ^ Profile, biography.com; accessed June 2, 2015. ^ Matt Lee; Ted Lee (February 26, 2003). "THE CHEF: BOBBY FLAY; Salmon Hot From the Oven, and No Slaving at the Sink". The New York Times. Both his mother's and father's families, he explained, were Irish-American going back several generations. ^ Colón, Suzan. "Bobby Flay's Party Plan". Hearst Publications. Retrieved July 22, 2012. ^ Puente, Maria (May 28, 2003). "Easy-Bake Oven Gets Its Own Cookbook". The Spokesman-Review. p. D10. Retrieved July 22, 2012. ^ "Flay Does it His Way – Interview with Chef Bobby Flay". Wannabe TV Chef. January 22, 2010. Retrieved August 2, 2014. ^ Freeman, Danyelle (October 10, 2008). "Bobby Flay will be grillin' & chillin' at Chelsea food fest". nydailynews.com. New York Daily News. Retrieved December 12, 2008. ^ a b "Stephanie March, Bobby Flay". The New York Times. February 20, 2005. Retrieved September 5, 2007. ^ a b c "Here's Bobby". Food Network. Retrieved June 20, 2009. ^ a b c d "Bobby Flay". CBSNews.com. CBS Worldwide Inc. May 16, 2002. Retrieved October 8, 2007. ^ "Bobby Flay Opens BAR AMERICAIN, an American Brasserie, Today at Mohegan Sun". MoheganSun.com. Mohegan Sun Newsroom. November 18, 2009. ^ Fabricant, Florence (December 26, 2006). "Off the Menu". NYTimes.com. The New York Times. Retrieved January 9, 2008. ^ "The French Culinary Institute Culinary Arts Programs: News & Press". The French Culinary Institute, Inc. Retrieved August 29, 2007. ^ "Flay's Role besides being a Chef". PioneerChef.com. July 17, 2014. Archived from the original on July 30, 2014. Retrieved August 2, 2014. ^ Flay, Bobby. "Ask Bobby". BobbyFlay.com. Retrieved August 29, 2007. ^ "Bobby Flay". Nationwide Speakers Bureau, Inc. Archived from the original on May 18, 2006. Retrieved August 29, 2007. ^ Marcus, Erica (July 15, 2008). "Bobby Flay opens Burger Palace". NewsDay.com. Retrieved August 5, 2008. ^ Flay, Bobby (December 5, 2008). "Bobby Flay News". BobbyFlay.com. Retrieved December 12, 2008. ^ Fabrikant, Mel (March 31, 2009). "Bobby Flay Opens Bobby's Burger Palace(BBP) Yummy Yum Yum". paramuspost.com. The Paramus Post. Retrieved April 2, 2009. ^ Marc (June 4, 2009). "Bobby Flay to Bring Bobby's Burger Palace to New England". ^ "An Early Look at Bobby's Burger Palace in DC". Washingtonian.com. Retrieved August 18, 2011. ^ "Food News: Bobby's Burger Palace in Roosevelt Field Mall (Garden City) Opens". eastyofnyc.com. December 6, 2012. Retrieved July 21, 2013. ^ Mary Zajac (June 4, 2012). "Bobby Flay's Burger Palace Opens in Maryland Live! Casino". blogs.citypaper.com. Archived from the original on May 10, 2013. Retrieved July 21, 2013. ^ Gorelick, Richard (October 11, 2011). "Table Talk: Bobby Flay's burger is matriculating at College Park". Baltimore Sun. Retrieved February 8, 2014. ^ Preston, Marguerite (September 3, 2013). "Mesa Grill Closed Sunday, But Flay Is Set On Relocating". ny.eater.com. Retrieved February 8, 2014. ^ Pang, Amelia (September 4, 2013). "Mesa Grill Closes, Gato to Open". Epoch Times. Retrieved February 8, 2014. ^ a b c "Bobby Flay's Biography". StarChefs. Retrieved January 31, 2013. ^ "3 Days to Open". Food Network. August 17, 2012. Retrieved January 31, 2013. ^ "Barbecue Addiction". Food Network. Retrieved October 22, 2018. ^ Flay, Bobby (August 14, 2007). "News". BobbyFlay.com. Retrieved August 14, 2007. ^ Salkin, Allen (April 17, 2009). "He's the Man Who Sets the Table". New York Times. The New York Times Company. Retrieved July 20, 2013. ^ "Allan Wolper Talks To Melba Wilson". 88.3FM WGBO. Archived from the original on June 17, 2014. Retrieved June 18, 2014. ^ a b Marin, Rick (June 6, 2001). "Lobsters at Five Paces, Knives and Egos Bared". NYTimes.com. The New York Times. Retrieved February 28, 2008. ^ Martin, Denise (November 14, 2006). "'Iron Chef' fires up Food net". Variety. Retrieved February 28, 2008. ^ "Iron Chef America: Thanksgiving Showdown". reality-tv-online.com. Retrieved November 17, 2009. ^ "Quebec chef wins Iron Chef with lobster poutine". cbc.ca. March 21, 2011. Retrieved December 10, 2011. ^ "Food Network Specials: Bobby's Vegas Gamble". Food Network. Retrieved July 26, 2007. ^ "Food Network Specials: Restaurant Revamp". Food Network. Retrieved July 26, 2007. ^ "Food Network Specials: Bobby's Vegas Gamble". Food Network. Archived from the original on March 15, 2007. Retrieved July 26, 2007. ^ "Food Network Specials: Tasting Ireland". Food Network. Retrieved July 26, 2007. ^ "Food Network Specials: Food Network Awards". Food Network. Retrieved July 26, 2007. ^ Morabito, Greg (March 15, 2010). "Bobby Flay Set To Star In New Reality Show on NBC". Eater.com. ^ "Watch Bobby Flay on Jeopardy!". Jeopardy.com. Sony Pictures Digital Inc. Archived from the original on March 21, 2008. Retrieved March 11, 2008. ^ Oller, Jacob (June 22, 2018). "Scooby Doo! and the Gourmet Ghost Is Deliciously Fun in the First Trailer". SYFY. Retrieved August 30, 2018. ^ Cuprisin, Tim (January 6, 2009). "Departing Channel 6 reporter Feldman made her mark covering health". Inside TV & Radio. Journal Sentinel. Retrieved January 5, 2009. ^ Hirsch, J.M. (January 7, 2009). "Bobby Flay taking a taste of radio". Associated Press. Retrieved January 5, 2009. ^ "Board of Directors". breederscup.com. Retrieved August 2, 2014. ^ Paulick, Ray (July 25, 2014). "A Better Breeders' Cup Board: Something Old, Something New". Paulickreport.com. Retrieved August 2, 2014. ^ Hall, Trish (May 8, 1991). "Sharing a Life Of Chefs' Hours And Pancakes". The New York Times. Retrieved July 26, 2007. Bobby Flay and Debra Ponzek, two well-known chefs in the New York food world, are getting married on Saturday [May 11, 1991]. ^ Miller, Samantha (July 13, 1998). "Hot Hands". People. 49 (27). Retrieved April 9, 2005. ^ Bender, Kelli (April 9, 2015). "Bobby Flay and Wife Stephanie March Split". People. Retrieved June 2, 2015. ^ "Bobby Flay, Stephanie March divorce reportedly finalized". New York Post. July 17, 2015. Retrieved January 23, 2016 – via Fox News. ^ "Bobby Flay Celebrates 1 Year with Girlfriend-Actress Heléne Yorke". February 13, 2017. Retrieved May 24, 2017. ^ "Cookbook Awards Past Winners". International Association of Culinary Professionals. Archived from the original on December 25, 2008. Retrieved October 8, 2007. ^ "32nd Annual Daytime Emmy Award Winners Release" (Press release). The National Television Academy. May 20, 2005. Archived from the original on March 17, 2007. Retrieved October 8, 2007. ^ "Winners for the 36th Annual Daytime Entertainment Creative Arts Emmy Award" (PDF) (Press release). The National Academy of Television Arts & Science. August 29, 2009. Retrieved April 9, 2015. ^ "The Winners for the 41st Annual Daytime Emmy® Awards" (PDF). National Academy of Television Arts & Sciences. August 13, 2014. Archived from the original (PDF) on August 6, 2016. Retrieved August 13, 2014. ^ "The Winners for the 42nd Annual Daytime Emmy® Awards" (PDF). National Academy of Television Arts & Sciences. April 26, 2015. Retrieved April 26, 2015. ^ "1993 James Beard Foundation Restaurant and Chef Awards". The James Beard Foundation. Archived from the original on October 13, 2007. Retrieved October 8, 2007. ^ "2005 James Beard Foundation/Viking Range Broadcast Media Awards". The James Beard Foundation. Archived from the original on November 12, 2007. Retrieved February 28, 2008. ^ "2007 Who's Who Nominees & Winners". The James Beard Foundation. Archived from the original on August 27, 2007. Retrieved October 8, 2007. ^ "Bobby Flay Inducted". culinaryhalloffame.com. February 7, 2013. Retrieved April 10, 2015. ^ Martin, Annie (June 3, 2015). "Bobby Flay receives Walk of Fame". UPI. Retrieved June 4, 2015.